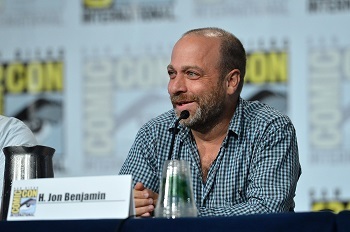 If you don't know H. Jon Benjamin you certainly might recognize his voice. He's best known for his extensive voice work. Over the years, he's played slackers like Ben, the son of Dr. Katz, in "Dr. Katz, Professional Therapist;" and the hilarious Coach McGuirk and Jason on "Home Movies." Most recently, you know him as the voice of Sterling Archer from FX's "Archer," and as Bob from Fox's "Bob's Burgers." Long before his recognizable voice work Benjamin's comedy career began in Boston. A lot of his earlier work was often done in groups or duos and emphasized on improvised comedy. He was part of "Tinkle," a live show combining music and sketches co-hosted by David Cross and Todd Barry. Then, there was the popular UCB show "The Midnight Pajama Jam," in New York City with Jon Glaser. Seriously, have you ever seen The Fuggedabuddies? He just wrote a new book called "Failure is an Option: An Attempted Memoir." In it, he recounts a lot of failures, which eventually opened the door to success. He talks about failures in family, in work, and in serving fajitas. This week, he talks with Jesse about how the start of his career in comedy meant the end for his parents family business, the differences between voicing Bob and Archer, and an honest look at his ebay purchase history. Plus, he'll reflect on his improv and stage days, and why he felt more comfortable performing with other people. Click here to listen to this interview on YouTube! Then, filmmaker Sara Driver, she just directed a new documentary called "Boom For Real: The Late Teenage years of Jean-Michel Basquiat." The film explores the early career of the great artist through people who knew him. Sara was one of those people. And she remembers what it was like to live near the Lower East Side of New York in the late 70's. She interviewed more than a dozen people who knew Basquiat personally. In the film, we hear from people like Alexis Adler. Now she's an embryologists, and but back then she was photographer. She was a good friend of Basquiat and often would go to concerts at local clubs in New York. She helped Basquiat find his first apartment when he was struggling to find a place to live. Other people featured in the film include Lee Quiñones. Lee is known for his colorful murals and bold wild style of graffiti on New York Subway trains. He talks about the brilliance of Basquiat's simple graffiti art techniques. The film also explore the bubbling downtown art scene, and music venues like the Mudd Club where Basquiat's band Grey played their first shows. "Boom For Real" kind of tells two stories: there's Basquiat's - who shows up in archival footage but never speaks. And there's New York City's. Pre-9/11, pre-Reagan, pre-real estate boom. Boom for Real strikes a careful balance between nostalgia and danger. Sara Driver will talk about how she scored so much archival footage of Basquiat doing mundane things. Plus, she'll talk about a Whole Foods that opened up in neighborhood a couple years ago. She'll tell us why she loves it, but why it made her miss the old New York. It's a different one this week. It's not a film, tv show, or album recommendation. But please, enjoy this delicious recipe. 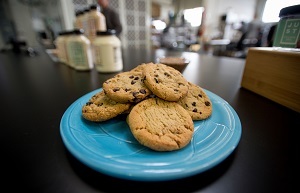 Jesse will tell you how to make the best mint chocolate chip cookies you've ever had.